Uncle Doc's Cards: So You Think You're a Collector? Since I have completed my Closet, I am undergoing the agonizing step of organizing my cards. Not only am I putting all of my cards in sequential order by year and maker, I am also combining several collections into one. Each night, my living room looks like a card shop exploded. One would think it is a pretty sight, but trust me, it is not. It's demoralizing, and downright dejecting. Recently, I just finished organizing my Bowman cards. That. Was. Hell. Having strayed away from Nu-Cards after 1995, I am trying to learn each year's card by sight. And don't even get me started on refractors, atomic refractors, etc. That's another post all together. As for base Bowman, I had such a hard time sorting the cards, that eventually I didn't even bother looking at the fronts. I had to sort by back so I could see the year. This is not like me. You see, I can tell you the year of a Topps card from 300 yards through a rifle scope. But put a Bowman two feet in front of my face, and I have to turn to the web or a book. It's not a pretty sight. I can't get past '91. That was the end of Bowman for me. Not long after that I gave up on the others. Q, W, R, I, E, B, E, K, T, P, F? or maybe J? or wait . . . I'm with you on this one. I have no clue. Q W R I E B K F T J P X S ... it's easy until you hit around 2001. Then they all look the same. Surprisingly, there was actually a time when I avidly collected and chased a good deal of Bowman's base set. Now, I'm starting to realize just how similar their last decade or so has been. Somehow, though, I guess most of the past designs have stuck in my head. Congrats on your organizing. As for this Bowman in order quiz, I would fail as I have the same problem with Bowman especially in the last 10 years or so. 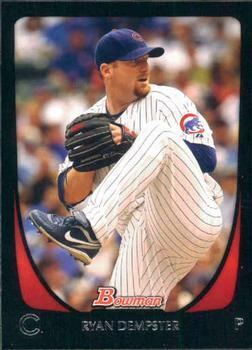 Forget about me recognizing 1990s Bowman as I've got very little of those if any after about 92. And even if you do get them into piles by year, you still have four or five different designs that don't necessarily correspond front and back. And the numbering...GAH! BPs and BDPs and DDBPs or whatever. I can't even try to fill a want list without names and exact complete numbers.